Check out the official Google Talk Blog - this week we launched a feature that allows you to set your Google Talk picture from your webcam. I wrote this as a small side project to teach myself Flash/Actionscript, which was quite, um, interesting, given my C++ background (I miss static type checking). It was a lot of fun though, and I owe many thanks to our UX designers who helped supply the necessary "Googley" factor. You can try it out here in the Google Talk gadget - simply click on your Google Talk picture in the upper right hand corner, and choose the "Take Photo..." option (you'll need a webcam to see this option). You can also see how it works (in Japanese) in this unofficial video. Have fun, and feel free to post feedback. 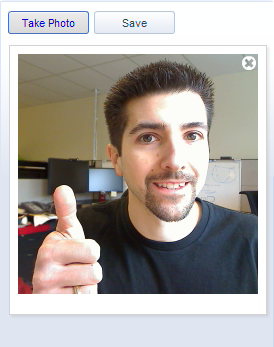 Google Talk + AIM = Now! It's been almost two whole years (and a new job and hometown) since I first blogged about Google Talk and AIM getting together, but today, it's ready to go! Starting this morning, we're rolling out AIM support to all Gmail accounts. You'll be able to link your AIM name to your Gmail account, and contact any of your AIM buddies directly from the Talk client inside Gmail. As a longtime resident of the AIM universe, I never thought that I would give up my favorite AIM Lite for a web client. But the AIM integration in Gmail is that good. It's fast, easy to set up and use, and works on any computer. Best of all, it saves your IM sessions in Gmail, which makes it easy to remember a conversation from months ago. Bottom line: if you use Gmail and use AIM, you'll probably really enjoy the combined experience. By default, your AIM buddies are displayed in the "most popular" order typically used in Gmail and Google Talk. To view them in alphabetical order (and enable the scrollbar), click on "Options" at the bottom of the contact list on the left side and choose "Top 250". You can also adjust the size of your contact list by clicking on "Options" and selecting between "Tiny", "Small", "Medium", and "Large". AIM users that are away or idle show up as yellow dots. The away message, if present, is displayed in the contact list. Your Gmail status message carries over to AIM, and vice versa. You can see AIM users' buddy icons, but setting your Gmail user avatar does not currently affect your own AIM icon. If you log into Gmail using HTTPS (as I mentioned here), your AIM session will be secured as well. This integration is not XMPP Federation. This was a contractual limitation. On the plus side, this means Gmail users don't need to manually add all their AIM friends to their Gmail contact list. Like it? Hate it? Favorite feature missing? Wish something was a little bit different? Send me a note, or drop a comment in the Gmail suggestion box. They say there is no such thing as a Seattle hiker who hasn't been to the top of Mount Si. With that in mind, I hiked the 4,167 foot mountain a few weeks ago with my brother, hoping a great view of the Snoqualmie valley would be waiting for us at the summit. Well, not exactly. Above 3500 feet, the temperature dropped below freezing, the Seattle rain turned into snow, and there was little protection from the wind. We scrambled over snowy, slippery rocks to arrive at the first summit, where we found that the view was indeed terrific... for about 100 feet. Regardless, the snow added a fun twist on what was already a great hike. If you ever have the chance to hit Mount Si when the conditions are right for snow, I highly recommend trying it.